On NCIS Season 13 Episode 1, Gibbs life hangs in the balance as the rest of the team go on the hunt for Daniel Budd. Find out how it all turns out when you watch NCIS online! Tony brings Gibbs to Dr. Cyril Taft, who operates on him to try and save him after he was shot in the chest and knee. During the operation, Gibbs hallucinates and see his young daughter, who tells him he needs to stop living in the past, and that there are people who need him. In the meantime, Vance orders Tony to work with Teague in hunting down Daniel Budd and The Calling terrorist group. A few months pass and Gibbs arrives back at the bullpen, surprising everyone. Vance orders him to remain on administrative detail, and to assist his team in providing support to Tony and Teague. He pays a visit to Matthew Rousseau in prision, looking to get some intel on Budd. After Rousseau taunts him, Gibbs stabs him in the hand with his pen. He tells him they can make a deal after he gives Gibbs some information. Shortly afterward, Rousseau is found dead and hanging in his cell. Tony and Teague travel to Shanghai, based upon information acquired from one of Teague's CIA contacts. They believe Budd and his gang have moved their operations there. Meanwhile, the Secretary of Defense calls the NCIS gang into MTAC to tell them that they have information that the North Koreans are arming a nuclear warhead, and that one of the computers tied to the North Koreans belongs to NCIS. McGee confirms it, and discovers that Ned's laptop has been hacked and is being used as a back door into the defense warning system. How does the North Korean threat tie into The Calling? And what happens with the hunt for Daniel Budd? Find all this out and more when you watch NCIS Season 13 Episode 1 online! 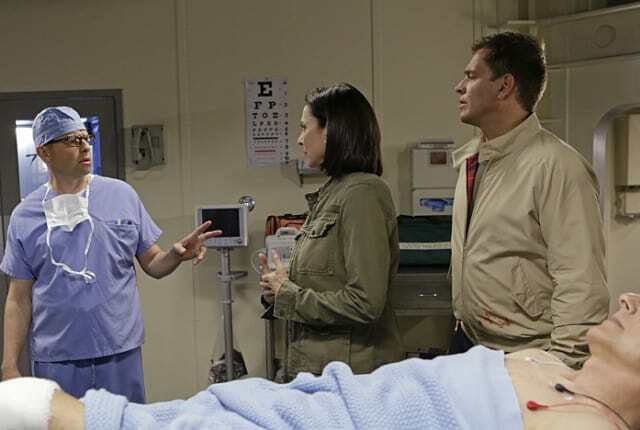 On NCIS Season 13 Episode 1, Gibbs continues to fight for his life after being shot, while DiNozzo and Joanna Teague attempt to take down the Calling.